When Sundance is in town, I head to St George - at the extreme other end of Utah. Sundance takes place in mid-winter, when Park City is blanked by snow and cold. Sundance brings celebrity watchers, crowds and a well-oiled hype machine. I choose to trade all of that for sun and solitude. I hiked in the St George area over the weekend and had a great time. Conditions were perfect, with blue skies and warm temperatures. 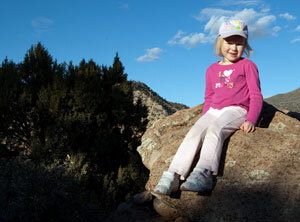 We hiked in shirtsleeves and enjoyed warm sunshine. We hiked in the Red Cliffs Reserve are in total solitude. We had grand kids with us and they really enjoyed running around in the sand. On the way to our trailhead we drove past a couple golf courses and they were busy with people enjoying the greens. It was also a perfect day for golf. The forecasters expect St George weather to be beautiful for the next week or more, putting us into February. Spring comes early in the St George area. The almond trees bloom in mid or late February, and the desert wildflowers start to appear about that same time. February is the dead of winter in many parts of the US, but it is a delightful time to visit St George.